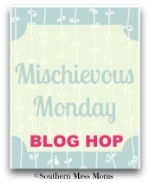 Its that time once again for our Mischievous Monday Blog Hop. You can join in on the fun of our blog hop by clicking HERE. So what exactly did I do this time? Keep on reading to find out. I have a reading circle where I sit and read my books. Its usually just one book at a time but this time the book mommy left me with wasn't interesting enough so I decided that I wanted to add a little bit more to the collection. What I didn't realize was that getting more books means making a big mess in the process. Mommy came back and caught me in the process but that didn't make a difference to me. I was having fun! There has to be something in here to read! This might be good. Forget about the others on the floor! How about just one more? Oooooh! I think I finally see what I want! It's all about the Very Hungry Caterpillar! So after making a huge mess on the floor guess who had to clean it up? You got that right, the not so happy mommy! what a cutie...she is sure is busy and very smart for choosing books. Awwww. Mommies always have to clean up after the kids finish having fun. Got to love that she is so interested in the books, though, that is awesome. My two boys are so bad about taking out books and not putting them back :) I try not to get too angry though since at least they love to read! We all love that book here! Well the kids do. I still haven't gotten the point of it. I get that he eats until he's sick..because he's growing, right? Right! Growing! Cute pictures! I agree, Madison. Messy, yes. But fun, too! And you look cute! Cute busy girl! What a joy that she loves to read! so cute! molly does the same thing! i'm staring at a pile of books now... not looking forward to cleaning up that mess. Who said books aren't fun? Omg this is too cute. Aww - what a cutie! And great book selection! How cool you knew just what you wanted and went to get it. A girl after my own heart! Aww! I love to see little ones reading! Oh my! My youngest loves to take all his book off his shelf and dump them all over the floor. Sometimes he'll even go into his big brother's room and pull all those books off the shelf too! Aww your daughter is so precious. Lol. My kids rooms look like tha tand worse! I love her decor. This looks so familiar! It seems to be a constant until after the age of 3. At least it gives grumpy Mommies a chance for exercise - bend and stretch, bend and stretch! Little Miss Madison, what a great choice of stories! Everyone knows that we girls love to have choices, but next time... you'd better help clean up so that your mom won't stop buying you all those cool books! Don't tell her that I told you though... it can be our little secret! haha.. looks like you and my daughter have a lot in common!! Oh the joys of pulling out every book in the house. At least your daughter doesn't seem to be ripping them up or coloring in them! Have fun picking up all those books! it's worth it if it means she loves to read, right! hahah!! Well, at least she got the one she wanted!